What Is the Dining Experience like in Spanish Speaking Countries? Before you begin working your way to foreign language fluency, it helps to understand the culture behind the language you’re learning. After all, language exists to help a group of people express their ideas and beliefs. Spain is an old country with a rich history and culture. As you begin your Spanish language program, gaining a strong grasp on this history, the values, and the etiquette will help you rapidly achieve success. In particular, dining out in Latin America and Spain is a dynamic and memorable experience with very high expectations. 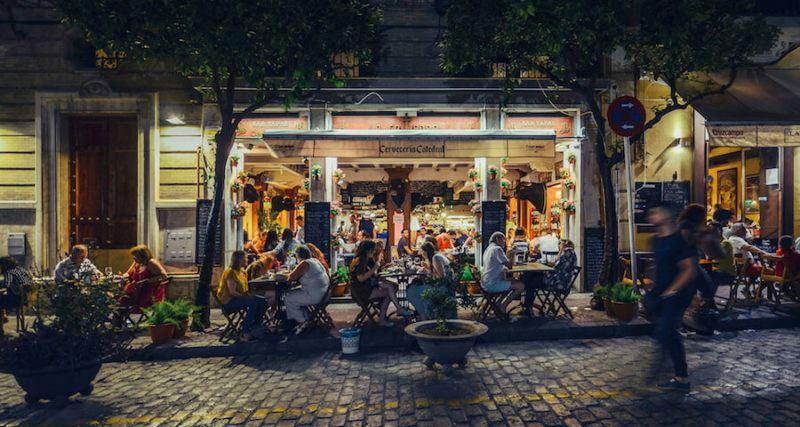 Eating out is popular amongst citizens all of the socio-economic statuses in Latin America and Spain. Availability of prepared foods begins early in the morning when taco stands and juice vendors open their windows. Many locals enjoy small bites like tacos for breakfast. In Latin American, street food is very popular because it allows consumers to be able to grab a delicious snack or an entire meal in a matter of moments. Consumers enjoy sitting down for their meal, as well. Small eateries, known as “fondas,” serve predetermined lunches. In addition, restaurants of all scales are open into the early hours of the morning, serving drinks and food. Consumers can easily choose good food that fits all budgets, an appealing feature of Latin American and Spanish cuisine. US-style fast food is also popular in Latin America and Spain. In fact, walk into a shopping mall food court and you’ll instantly recognize major chains or similar reproductions ready to serve hungry costumers. In contrast, notable restaurant districts serve high-end cuisine. In these areas, it is easy to find food styles from across the globe, including Italian and Thai. Restaurants like these offer more than quality food, they have more sophisticated atmospheres to establish a better dining experience. Over the weekends, locals take their meals outdoors. Picnics and barbeques are popular in Spanish culture. Families and friends gather together to enjoy quality food and company. Popular picnic foods include meat, guacamole, and freshly made salsas. Best of all, an opportunity is presented for families to prepare meals together while passing down traditional cooking techniques to the younger generation. “Antojitos” (snack foods) can be found in street markets and on the menu at small restaurants. A simple taco with meat or a vegetarian substitute inside a small corn is one of the most popular Latin America antojitos. Tacos keep the stomach full while fitting any budget and enjoyed by all Latin American citizens. Stop at nearly any taqueria and you will find options like “carnitas” (marinated pork), “arrachera” (skirt steak), “birria” (goat), “picadillo” (ground beef), c”ampechano” (chorizo sausage), and even “cabeza de res” (boiled cow head) as meat options for your taco. Vegetarian fillings you may encounter at the taqueria include “huitlacoche” (Spanish truffle), “rajas” (roasted poblano peppers), and “noaples” (cactus paddle slices). Geographical and cultural influences also contribute to the variation in taco styles. For instance, in Latin America, it is common to find Tacos al Pastor, a style originally inspired by Middle Eastern shawarma. Both dishes share a similar preparation method that involves a tower of skewered meat rotating as it is cooked. This tower is known as trompo and after it is cooked, the meat is shaved off and incorporated in both beloved dishes. But of course, the most enticing element of antojitos is all of the toppings! Traditionally, tacos are topped with freshly squeezed lime juice, diced onions, and chopped cilantro. An array of fresh salsas are also available as taco toppings, including “salsa verde” (a green salsa), and “salsa roja” (red salsa). Guacamole and pico de gallo are also enjoyed as antojito toppings. Tipping is welcomed in most places in Latin America and Spain. In fact, some workers receive most of their income from tips. For instance, servers, bartenders, bellhops, and maids all appreciate receiving a few extra dollars for their hard work. And, given hourly pay rates in the service industry are amongst the lowest, good tips can dramatically affect a worker’s budget. Generally, a 10 to 15% tip is standard at cafes and restaurants. However, if the experience and service are exceptional then a higher tip may be appropriate. In some instances, cafes and restaurants will include the tip in the bill. Generally speaking though, the tip is determined by the costumer’s discretion. As for food stalls and vendors, tipping is less common. Hotel staffers receive modest tips, often around the equivalent of one US dollar for the service provided. In some instances, hotel guests on lengthy stays will leave a daily tip for the housekeeper. Often, it’s common to tip your tour guide. A good guide provides vast cultural and historical insight that a traveler may not learn solo. Indigenous guides in remote areas receive very low salaries. For these individuals, a few dollars for a tip can be significant. In addition to the service industry, it’s common to tip people in the entertainment business. Latin American and Spanish performers often congregate at bars and restaurants. Mariachi bands often make appearances and may even sing you a song! For such occasions, a tip is appreciated if you enjoyed the music. A couple dollars is an appropriate amount.